All major brands of forklifts are available here on ReconditionedForklifts.com, including used Komatsu forklifts. One of the world’s first manufacturers of heavy duty materials handling equipment, Komatsu’s roots go back to 1921. Increasing demand for Komatsu forklifts in America led to the establishment of Komatsu USA in 1976. Komatsu’s Covington, Georgia manufacturing facility reflects the company’s policy of cost efficiency combined with uncompromising quality. At Komatsu, the manufacturing process begins with raw steel and ends with some of the toughest forklifts in the world. A heavy duty manufacturer from the beginning, that’s the only way Komatsu knows how to build them. That’s probably why even an older used forklift from Komatsu can be a reliable workhorse. At ReconditionedForklifts.com, we share a similar business philosophy with Komatsu. Our parent company, Bahrns Materials Handling Equipment & Supplies, is a highly respected name in central Illinois, where they have had their headquarters since 1966. This website takes advantage of the greater reach of internet commerce and allows us to offer the extensive Bahrns inventory of used forklifts to the broader materials handling community without having to increase their cost or forfeit service and efficiency. We are backed by Bahrns, one of America’s most respected names in materials handling. All orders are processed by the team at our Illinois warehouse. All equipment offered for sale on this site has been inspected and graded by our in-house team of highly qualified service technicians. Our staff is always available to you – just as if you came in to our showroom or warehouse in person. Large thumbnail photos clearly indicate the appearance of every forklift. No attempt has been made to enhance the external appearance of a vehicle. A prominent sticker will tell you whether the lift truck is being sold “As Is”, is “Guaranteed Operational” or has been fully reconditioned. That’s just the beginning. When you click on the image, you will be directed to a page that goes into further detail about the product and offers options to download the PDF about it or save it on your watchlist. 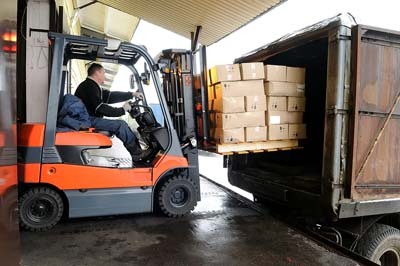 This gives you the opportunity to compare several forklifts before you decide to buy. If you have further questions, we encourage you to contact our customer representatives for more information. By the time you choose your used lift truck, you have the confidence of knowing you are getting exactly what you are paying for. If you’re looking for spare parts only, choose a “Parts Only” forklift and pay accordingly. If you want a forklift you can put to work immediately, your “Guaranteed Operational” used Komatsu forklift is just what it says it is – guaranteed to be in operational order. Learn more about our used forklift classifications system to make a more informed decision. Like Komatsu and Bahrns Equipment, ReconditionedForklifts.com is here for the long haul. We want you to know you can count on us to deliver quality, value and service not just today, but whenever you need us. Learn more About Us and learn why ReconditionedForklifts.com is a name you can trust.